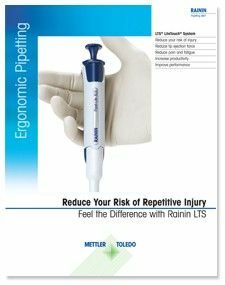 Not only is pipetting a forceful activity – it is repetitive, and minor stresses caused by strain and overuse accumulate over time and can develop into injuries.The Rainin LTS LiteTouch System protects pipette users by making tips practically effortless to load and reduces the force require to eject the tips by up to 85%. LTS reduces tip ejection forces by 85%. With traditional conical tip/shaft designs, tip ejection forces can be as high as 10kg, with an average of 4kg. Tip ejection force is only 0.6 kg with LTS.